In a previous house blog post, I mentioned doing a serious of "before and after" posts about how the new house compares to the old one - after all, we already have a house so there must be something different about the new one worth talking about! Here is the first - not focusing on any room this time, but the land and house as a whole. One of the major complaints about our current house is that it is too small! That isn't strictly correct - square metre wise, it isn't that bad, but it is laid out in such an inefficient way. In theory, our current house has four bedrooms, two and a half bathrooms, three living areas, a study, a workshop and three separate outdoor entertaining areas (two decks and a paved area). It doesn't exactly read like a bad real estate agent spiel at all - I have high hopes that when we sell it, the house will be very appealing to someone else with different usage patterns or requirements to us! In practice, half of the rooms are full of stuff (in boxes or crates if we are lucky - in a pile if not) due to a lack of built-in storage, and the rooms that aren't are .. lets say, very cosy. The main kitchen/living area is on the upper floor and doesn't have direct walk-out access to the backyard - unless you go out the front door and down the driveway. In addition, the garage is around the back of the house, which means we have a driveway separating one of the other living areas - the downstairs lounge - from the yard area. Neither of these are particularly helpful when you have kids - of course, it wasn't the kind of thing that was on our minds when we were 23! A picture is worth a thousand words .. so here are a couple of diagrams. The first is our current house on the left, and new house on the right, at the same scale, and both aligned so that up is north. The outline of the old house is based on the Google Maps satellite view, and the outline of the new house is based on a diagram provided by our architect. The new block is about 20% larger than the old one, and the new house also has a much bigger footprint. I didn't think the block difference was particularly obvious from this map. Note one thing which isn't apparent from this picture is that the old house has the same floor area on both levels, whereas in the new house the ground floor is only about 60% the area of the first floor. 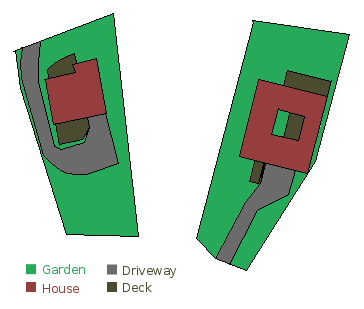 The 'garden' area on this diagram pretty much means 'the rest' - some bits are lawn, but many areas are concreted pathways, rock gardens, retaining walls, or otherwise areas which are impractical for use as 'backyard' due to shape and slope. Note that this applies equally to the new house as well - it can't be helped on a sloped block - but at least we are taking it into consideration this time and making an effort to minimise it! 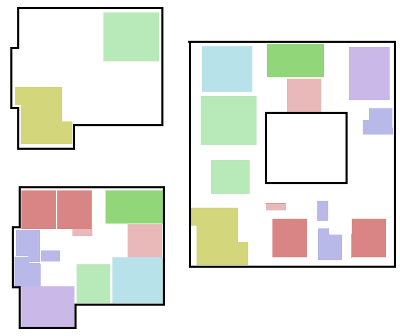 The second diagram shows both floors of the old house, and then matches up the corresponding room locationss on the first floor new house. Note that these images are also the same scale - it looks totally wrong, especially compared to the previous diagram, but I have triple-checked and put it down to the fact that the old house outline on the first diagram included the eaves. As you can see almost all of the old house will "fit" on the first floor of the new house, with a room to spare (eventually for the third child)! This is great as it means we (including the kids) generally won't be running up and down the stairs constantly - pretty much only when we leave the house. The unmarked areas on the old house ground floor include the garage, laundry, and storage/workshop/office area. I won't worry about these ones in this post, but they will get their own post eventually when I do the room-by-room comparisons!